To better assist the reader in search of more information it was thought helpful to include synonyms that are in horticultural use or used in the references included. Many times plants get renamed or transferred by one authority without being accepted by some or most others. In some cases, such as Stenocereus, it is not uncommon to find several different names for the same plant depending on which reference work one consults. While it is unlikely that they would be encountered and still referred to as a Cereus, as many cereoids were originally called, it is just as likely they will not be listed by MOST sources as a Stenocereus. Any feedback on how this could be made more useful and accessible is welcomed. They can vary as well according to the age of plant (young plant versus adult plant) or even by age of part (such as new growth on a large adult compared to older growth). In cacti, the actual variables effecting such reports are, usually, unknown and unstudied. Very few workers seem to concern themselves with any of this and rigorous work on this subject has rarely been performed or published. The bottom line is that a published analysis says something about the actual material analyzed by those particular workers and can be reliably extrapolated to mean almost nothing concerning what YOU have or another person possesses. It CAN be valuable as an indication of what molecules might be anticipated but the composition and quantification of alkaloids needs to be determined on YOUR plants in order to know what you actually have. Plants do not read, listen to or follow the publications of scientists. Often the only data included is whether the plant was cultivated or collected from the wild. In many early papers we literally have to rely on the word of the workers as to the identity of what they analyzed, as vouchers for reference’s sake were never prepared and there is no physical means for confirmation. Fortunately, in recent decades, far more attention is being given to the importance of proper herbarium vouchers being prepared for any and all plant analysis. Even in these cases, not all workers note enough variables for their observations to be truly meaningful. Critical data for wild plant collections: size and approximate age, part of plant used and stage of growth, i.e. actively growing versus fully developed (if sampling only branches of large specimens), and time of harvest (time of year and time of day) should all be included along with place of origin and elevation of occurrence. Ideally for a voucher some comments on the local ecology and a description of habitat would also be quite valuable. This could include the plants growing around it, or with it, the immediate local conditions of occurrence [moisture, degree of sun, etc…], its apparent niche in ecosystem, and a description of the land or terrain. Even better would be additionally including a local soil test and/or sample, and analyzing as many parts and ages of material as possible, as well as repeated tests with the same specimens at different times of year. If performing repeated samplings of the same individuals; stress can become a factor capable of influencing the results. I suggest initially using pooled smaller samples of adjacent individuals within a given population. There should be additional small samples taken from several individuals within the same population that is pooled in order to check for uniformity and evaluate the degree of potential influence from outliers. Most plants can recover rapidly and well from light prunings. A minimum of two years time is suggested for such a series of samplings with a maximum of 6-8 trimmings. Differences in regrowth versus original growth should also be evaluated. The factors controlling and regulating alkaloid production would be a fascinating and productive area for future academic research. If chemotaxonomy is to ever be considered a truly useful inclusion in the repertoire of taxonomic tools, science needs to be better able to define the parameters of alkaloid production. Determining and taking steps to maximize alkaloid content would also be of benefit for those who view these plants as sacraments. Selection for known high alkaloid strains, or focusing on clones of specific exceptional individuals, for intensive large scale breeding and propagation efforts, would be a worthwhile avenue for everyone involved with sacramental use of these plants. Nonbold face specific names indicate acceptance as a species is still not widely recognized. Please note that this system of organization is presently no longer accepted by most authorities but it is still commonly encountered in horticulture and among ethnobotanists. However, an attempt was made by Albesiano & Kiesling in 2011 to resurrect the genus Trichocereus and all of the molecular work to-date indicates that they are on solid ground. See elsewhere in this work for more details. Most of the species listed contain only trace amounts. Species marked * lack formally published analytical work but have successful human bioassays reported. Species marked ** have unpublished analytical work confirming mescaline’s presence as well as successful human bioassays reported. Species marked *** have both published analytical work & successful human bioassays reported. DNA work by Wallace suggests that this may be Lophophora diffusa’s closest relative. Reported to contain over 2% hordenine by West et al. 1974. This is that same list but using the currently accepted names. Species that are missing from this list were variously discarded, merged or ignored in the revisions. Details can be found under their entries. One thing that careful readers will notice about this arrangement is that some of the new combinations merge plants with quite different published chemistry. If a plant reported to contain mescaline was renamed as a synonym of one which did not it was omitted from this list. I would suggest that these be looked at closer with an eye for possible subdivision into chemical races. Comparisons of Anderson, Hunt & others will also rapidly reveal a lack of agreement on a number of points and the seemingly capricious acceptance of some and rejection of others with little if any comment. Hunt’s lack of meaningful references, including in some cases the actual describers, precludes any resolution in a number of instances. Some of the combinations are so peculiar as to have caused me to wonder if Anderson and Hunt really actually examined flowering specimens or in some cases ANY actual specimens. In several cases, the mergers were published by people who seemingly lacked first-hand examination of the material. For instance the peculiar assertion that the slender, densely branching Trichocereus uyupampensis Backeberg and the stout, solitary columnar Trichocereus validus sensu Backeberg are synonymous. When faced with this situation we would suggest to botanists that they should not be afraid to say “I don’t know” or at least search out bona fide materials before uttering such pronouncements in print. What is perhaps most fascinating is the movement within the Opuntioidae towards lumpy definitions of the species accompanied by a splitter’s view of the genera. Distribution of alkaloids *within* cacti. Surprisingly there has been very little serious work published on this topic. 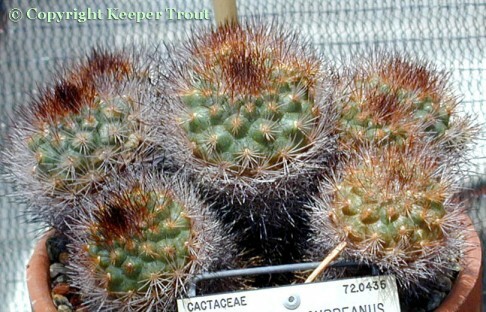 In Trichocereus candicans alkaloids were found by Niedfeld to be mainly in the chlorophyllaceous cortical parenchyma. (Niedfeld used microchemical methods to determine this) RETI 1950 cited NIEDFELD 1931. Parenchymal tissues are highly specialized thin-walled storage cells that exist within in the thick outer layer on the plant. They are the site of many metabolic processes and also store such things as water, calcium oxalate crystals and often alkaloids. Calcium oxalate crystals are said to be stored in abundance in some peyote specimens. A nice image of showing their presence inside of the flesh of peyote can be found in the entry for Lophophora williamsii. As far as I can determine, the parenchymal tissues extend from near the skin to the vascular bundle; including most of the tissues other than vascular, structural or connective. As there is considerably more weight to the central parts than the green portion, the observations from RETI & CASTRILLÓN 1951 provide some support to the idea common amoung users that the highest mescaline concentration is within the green tissues on the periphery of the plant. “Less” does not mean that there is no alkaloid in the whitish tissues beneath it. All evidence suggests that there is ample alkaloid contained in these parts, just significantly less than in the green layer. It is also likely there is even less in the central vascular bundle and core itself. Another interesting result was noted among SMOLENSKI and coworker’s multitude of general alkaloid screenings. When testing Pachycereus pecten-aboriginum they reported Roots: ++, Stems: – and Ribs: +++. As slicing off the ribs would remove most of the cortical tissues this is in line with the above observations. Their account provides no further information on tissues evaluated (samples provided to them as a previously prepared extract). There is additional support for this; DJERASSI et al. 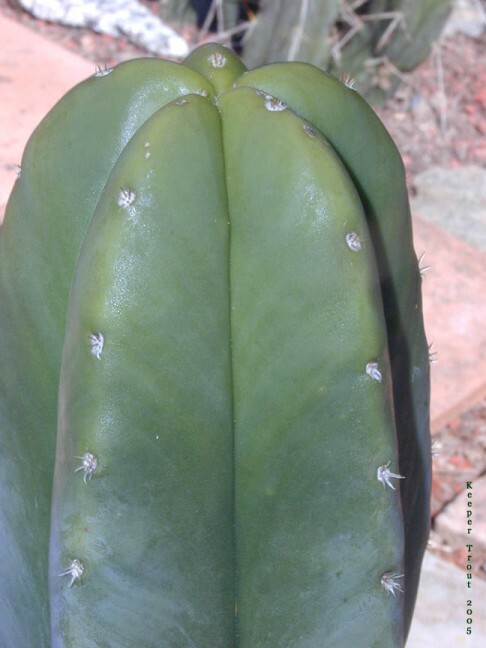 1953b determined that the majority of the alkaloid content in Lophocereus schottii was in the green epidermis (6.7% crude alkaloid); only a minor portion in the cortex (1.1% crude alkaloid) and almost no alkaloid in the core & pith (0.2% crude alkaloid). By cortex Djerassi means the epidermis, by green epidermis Djerassi refers to the chlorophyllaceous parenchyma. Djerassi was a natural products chemist not a botanist. This is also in at least partial conflict with the reports of other workers. 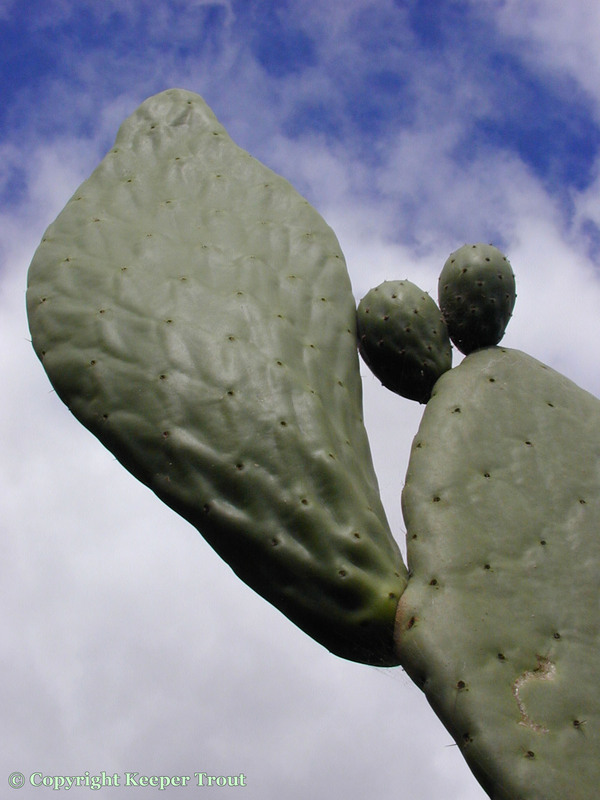 GUTTIERREZ-NORIEGA 1950 (citing CRUZ SÁNCHEZ 1948) appears quoted as saying that the alkaloids are primarily in the “bark” of T. pachanoi. His word, corteza, translated in the English summary as bark, also means ‘cortex’ or ‘skin’ in Spanish. Apparently CRUZ SANCHEZ worked with the outer layer due to the slime resulting from use of the whole stem interfering with his extraction procedure. He reported 5% in the dried outer layer. This area needs further work. While many alkaloids may indeed be higher towards the outside of the plant there are known exceptions. Hordenine being observed in the root rather than the top (in peyote) is a good example. Its highest concentrations being in the root was reported again in Mammillaria microcarpa by KNOX and coworkers. It is noteworthy also that all of the alkaloids measured by KNOX were much higher in the cortex itself as compared to the chlorophyll rich tubercles and several were higher in the vascular tissues than in the tubercles. An Entheogen Review reader wrote to say that they had found an unspecified amount of the cores of San Pedro to be active but they provided inadequate information for us to understand HOW they actually determined this or how much they observed. This should not be any surprise should a person ingest a large enough amount. PUMMANGURA et al. 1982 reported that mescaline did not transmigrate between grafted T. pachanoi and T. spachianus regardless of which was used as stock and scion. Their conclusion was that mescaline was locally produced and noncirculating. 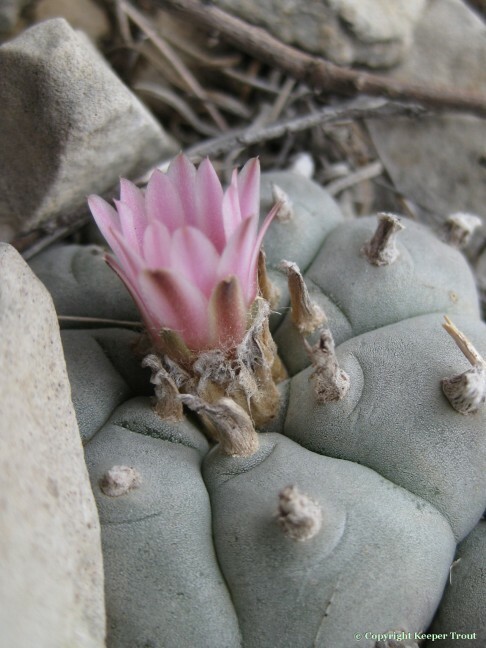 While it may or may not be true that transmigration of alkaloids does not occur, SINISCALCO 1983 reported that the normally mescaline-free Myrtillocactus geometrizans was found to contain 0.3% mescaline by dry weight after having previously been grafted with Lophophora williamsii. Many questions immediately arise. None are presently answerable. Trichocereus scopulicola FR991 seedling (NMCR); from Ritter’s species but using seed acquired from Riviere de Carault. Knize did not elaborate further (and I’d suggest this be taken with a large grain of salt). A friend has claimed to have had good results from the flower masses they collected from peruvianoids and terscheckii but preserved no details. In more recent years, additional friends ingesting pachanoi and peruvianus flowers and ovary could discern no effects whatsoever. Clearly some analytical work seems in order to know what to believe. There IS something that perhaps may be true? In evaluating the reports of human bioassays it is always important to be able to identify and preclude the contributions from any “non-negative placebo responders” (to borrow Jim Ketchum’s wonderful phrase). It is almost unbelievable that no one has looked into the matter of alkaloid distribution within cacti more thoroughly. The analysis of only the outer green layers and only looking at only mescaline has become the predominate analystical approach. This is for practical reasons not a reflection of a fixation on mescaline. 1. 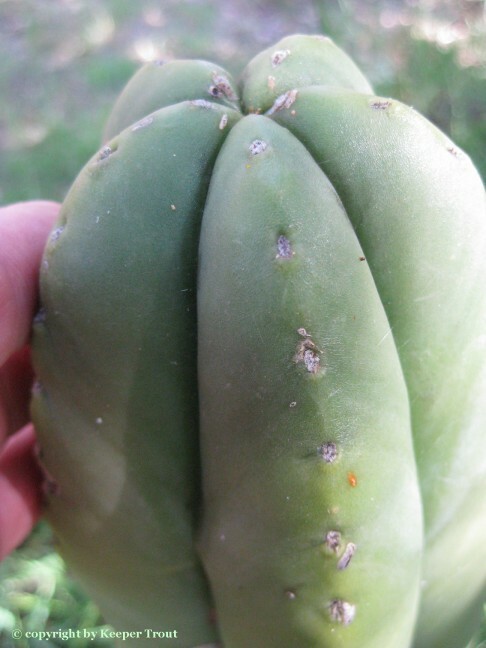 It is easier to work with the slimy inside of the cactus if only the outer green layer is used. 2. Most researchers would LOVE to look at every alkaloid in their plants but due to a lack of reference materials the necessary standards are simply not available through commercial sources. Out of the 63 alkaloids reported from peyote, for example, only 5 or 6 can be obtained from fine chemical houses. Historically workers doing structural analysis would accumulate and save their purified alkaloids. These were then shared with other people doing the same work. When they were still active in research, Jerry McLaughlin & Arnold Brossi were the actual reference standard resources for multiple other workers. Synthesis is also possible but the actual cost and ability to create an functional set of basic cactus alkaloids reference standards via synthetic means is out of the reach of the average grad student performing analysis on the alkaloids of a plant. Mescaline, by contrast, is relatively easy to obtain as a pure reference standard so it now tends to be the only target being identified and quantified. Trichocereus scopulicola grown from seed in Oz. All of these originated as FR991 seed that were acquired from Ritter’s sister Hildegarde Winter but Australian cactus producers have been generating and relying on their OWN domestic seed production from the *plants* that were produced from Winter’s seeds since the 1960s.